It’s that time of year again and Christmas cards will soon be traveling across the country and around the globe! With ever-increasing postal rates, sending Christmas cards can be expensive. Follow these tips to save money on postage. The first step toward saving money on Christmas card postage is to reduce the number you send through the mail. Look over your Christmas card list and remove the names of people with whom you are no longer close. Of those remaining, which recipients MUST receive a card by mail and who can receive greetings in person or by email instead? Recycle old Christmas cards into postcards. The cost of mailing a postcard is significantly less than that of mailing a regular greeting card. To qualify for the postcard rate, the postcard must be rectangular and at least 3½”x5” by 0.007 inch thick but no more than 4¼”x6” by 0.016 inch thick. Postcards outside these dimensions will require extra postage. 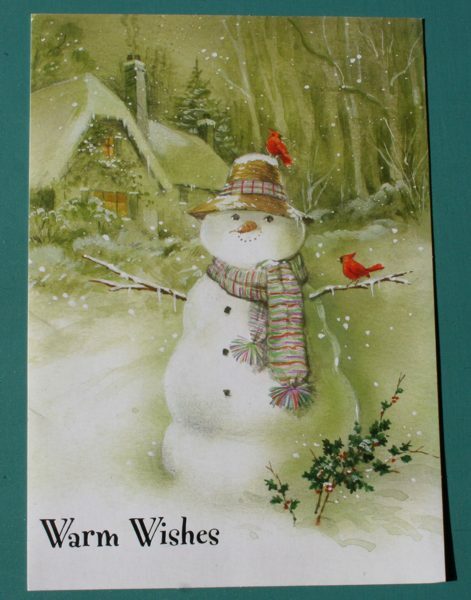 For added savings, recycle old Christmas cards into postcards. Just cut the fronts to the required dimensions and add your message, the address and required postage to the reverse side. Although there are lots of online e-card sites available, many people (me included!) are wary of commercial e-cards. So opt for a more personal touch and make your own card or Christmas letter on your computer, convert it to PDF and send by email to friends and family. Remember to include photos! Keep in mind that you can edit your computer-generated card or letter to postcard size/format and print on cardstock to send to those who will not be receiving it by email. And be sure to check with the post office for information on size restrictions and postage requirements for international mail. Warning! Even if the grandparents on your list have email, they still want a real card with a handwritten message! Great tips! Thanks for the suggestions. I never thought of using the inside of old cards as postcards. What a great idea! I like the idea of recycling old Christmas cards...I hate discarding them!